This edition of Virtually Blind’s Reading Room features an article addressing legal issues associated with virtual item transactions. 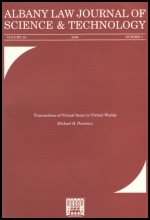 The article, Transactions of Virtual Items in Virtual Worlds (.pdf), by Michael Passman, is available here courtesy of the author and the Albany Law Journal of Science & Technology. Passman is a recent law school graduate who works at Cassiday Schade LLP in Chicago. In the interviews, thirty-six percent of users stated that buyers should expect to receive extra or different features from those the buyers thought they would receive. In a world where there is no way to tell who a seller really is, or sometimes even to find someone again after an initial meeting, it is not surprising that over one-third of users expected purchased items to be a little different than represented to buyers. Virtual world users are similarly split on whether or not a buyer has the choice to invoke the Article 2 breach rules in the case of a partial shipment. Fifty-four percent of users expected buyers to be able to cancel the whole deal if they did not receive every item for which they had contracted. Forty-one percent of users did not expect a buyer to have the power to cancel the whole deal under such circumstances. Passman draws some interesting conclusions from his interviews including, as noted above, that virtual world users expect licenses, not sales. He also concludes that the standards governing breach of contract should be relaxed for transactions in the virtual world because “buyers” (or licensees) understand that there’s a good chance they’ll not get what they apparently bargained for. I suspect that this paper will draw some attention, as it takes a fresh — and potentially controversial — stance on virtual item transactions. Virtually Blind’s Reading Room is here to make virtual law papers, particularly papers that haven’t yet been widely distributed, broadly available to attorneys and scholars interested in virtual law. If you have a paper you’d like to have hosted here, drop me a note.